Are Harry Styles and Kimberly Stewart Dating? 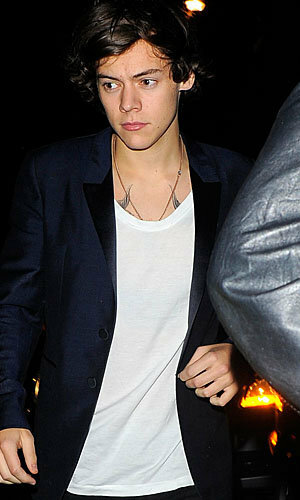 One Direction's Harry Styles, 19, has his whole life ahead of him. And will part of that life include becoming a stepdad and Rod Stewart's son-in-law? Well, we might be jumping ahead, but according to a source omg! spoke with, Styles and 33-year-old Kimberly Stewart are seeing each other. "I'd use the term dating loosely," says the source, who saw Styles and Stewart (who has a 2-year-old daughter with actor Benicio del Toro) together at West Hollywood eatery Dan Tana's on Thursday night. But it wasn't a romantic dinner for two. Instead, Stewart brought along her whole family including dad Rod, his wife Penny Lancaster, Kimberly's 32-year-old brother Sean, and Sean's on-again, off-again girlfriend, "The Real Housewives of Beverly Hills" star Adrienne Maloof, 51, who apparently are back on. Between Harry and Kimberly, Stewart and Adrienne, and 68-year-old patriarch Rod and his 42-year-old wife, Penny, the average age difference between significant others at that dinner was 19 years. Welcome to Hollywood!